On November 30, the Ministry of Health in Spain has finally submitted the consensus document on Multiple Chemical Sensitivity. Two years ago, José Luís Aparicio, a MCS sufferer, and I were interviewed at the Spanish radio program Carne Cruda. They were so shocked by MCS that decided to contact the Ministry of Health because they wanted to interview them in their show to explain to them the terrible situation of the MCS sufferers. After a lot of calls to the Ministry of Health without receiving any response, they did a live phone call during the radio show and the Ministry had finally to accept. On January 2010, the Secretary General of the Ministry of Health, was interviewed on “Carne Cruda, in a special show devoted to Multiple Chemical Sensitivity with Miguel Jara, Dr. Pablo Arnold, José Luís Aparicio and David Palma on behalf of me. He made the public commitment to meet with associations that deal with MCS. 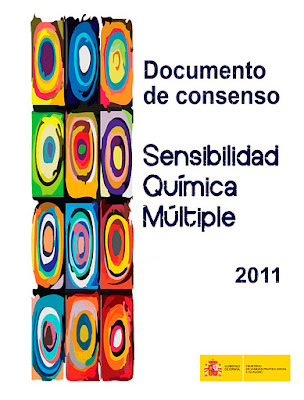 On February 2010 was held the meeting with Ministry of Health to state the situation of Multiple Chemical Sensitivity sufferers in Spain and they committed to create a Scientific Committee to elaborate the consensus document on MCS that has now finally been released. The document, that has 128 pages, will be translated into English by Ministry of Health and it will be reviewed within two years to include the new scientific knowledge. David and I want to thank everyone who has been part of this long process. From the doctors members of the Scientific Committee to the 13 MCS associations that set up the “Comité para el Reconocimiento de la Sensibilidad Química Múltiple” (committee for the recognition of MCS in Spain) to have an unanimous voice for this process, including Jaume Cortés, lawyer of the Colectivo Ronda, because his disinterested participation has been crucial for this achievement. And we want to specially thank to Javier Gallego, the director of Carne Cruda, and all his team because without their courageous attitude this day would have never come. David has remained as observer during the process and we greatly appreciate it to the Committee, and from now he split with the Committee because we don’t belong to any MCS association and we believe that our work is complete. Today is a great day for all the MCS sufferers in Spain. The consensus document on MCS, albeit imperfect, lays the foundation for future recognition of this disease and it finally does recognize that the MCS patients exist.